A familiar Perry Como song describes the joys of being “Home for the Holidays.” For many families, however, the holiday season can be the most stressful time of the year. Reunions at any time of year tend to have their share of conflict, and holiday gatherings especially can be emotionally charged. Why all the stress? It goes without saying, but family relationships are complicated. When some families get together, it doesn’t take long for the past to take over. Old patterns and roles quickly fall into place. Innocent comments are misunderstood. Unhappy childhood memories resurface and long-held resentments are expressed. Relatives are likely to have differing opinions on politics, religion and how to raise children. Everyone, of course, believes he or she is right. To compound matters, family members often share tight spaces. They’re worn out from last-minute preparations, shopping and traveling long distances. People may be visiting several households and feel obligated to show up. Small children get into scuffles and shriek or get in the way. The result? Your 40-year-old brother suddenly starts acting like a 9-year-old. Aunt Sally starts asking intrusive questions. And your mother overcooks the turkey yet again and is close to tears. Before long, “the most wonderful time of the year” becomes a time people dread. Be your best self. Start preparing days (or better yet, weeks) before the event. Eat plenty of fruits and vegetables, and forgo sweets. Drink enough water. Bump up your days at the gym or try a yoga routine. Get to bed at a reasonable time. The better you feel, the better equipped you’ll be to handle stress. Lower your expectations. Your family get-together won’t be perfect. Accept it. Embrace it. When you release yourself from unrealistic expectations, you give yourself the gift of appreciating what the gathering can offer. Develop a plan. You can’t change your family, but you can control your reactions and behavior. Know your triggers and envision how you can avoid overreacting. 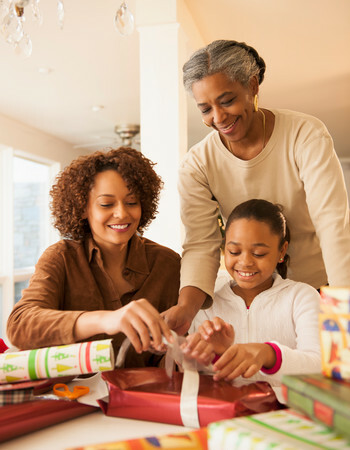 Forgive relatives for their annoying habits (remember, you have some too). Set some goals. Maybe you could informally interview your older relatives to learn more about your family history, or make a point to see each family member’s strengths. Most people yearn to be appreciated and heard. Be that person your family members treasure. Don’t engage in disagreements. Instead, take a few deep breaths or find a reason to leave the room. Now isn’t the time to settle a long-standing argument or share a deep-rooted frustration. If you need to confront someone, choose a different time and place. Be the calmest person in the room. Give up your need for control. Honor traditions. Find the recipe for your great-grandmother’s chocolate cake and surprise your relatives. Bring old family photos. Play treasured holiday music. Suggest family members attend a religious service together. Share humorous and sentimental memories. Start new traditions. If the women routinely clean up after the meal, suggest they retreat to the living room while the men roll up their sleeves. Play board games. Build a bonfire and roast marshmallows. Invite the adults as well as the kids to go ice skating. Volunteer as a family at a homeless shelter. Simplify. Sometimes less is more. Focus on appreciating the little things. Exchange white elephant gifts or draw names. Forgo the ham and turkey dinner, and instead enjoy homemade soup and special desserts. Take a walk together after the meal. Remember to send the hosts a thank-you card. Getting together with your family might not look like the warm festivities on the Hallmark Channel. That’s OK. Relax and focus on the positives of what your family offers. With a little effort, a holiday reunion can be a joyful occasion no matter what happens. To learn more about the Best Care Employee Assistance Program, go to bestcareap.org call us at 402-354-8000 or 800-801-4182. As a counselor with Best Care EAP, Joy Youngland, MS, MSW, LMHP, CSW, works with children, teens, adults, couples and families. Her mission is to give her clients hope and teach them skills to live quality, healthy lives. “I’m continually inspired by getting to see my clients become their best selves,” she said.